The vote keeps anti-abortion protesters 39 feet away from where people enter a clinic. The Portland City Council voted unanimously Monday night to create a buffer zone around the entrances of Planned Parenthood’s downtown clinic, where abortions are performed two days a week, to allow patients access to health care without harassment by anti-abortion protesters. The council enacted the 39-foot buffer zone as an emergency measure, so it takes effect immediately, effectively pushing the protesters across Congress Street from the clinic. Protesters have indicated that they will sue the city for violating their First Amendment rights to free speech and assembly. If they follow through, it will be the third free-speech-related lawsuit filed against the city in less than a year. The American Civil Liberties Union of Maine will argue in U.S. District Court on Tuesday that the city’s ban on loitering and panhandling in street medians violates the First Amendment. And the Friends of Congress Square argued successfully in court that the city’s denial of petition papers calling for increased protection for open spaces violated the First Amendment. The city is appealing that decision. On Monday night, City Councilor Kevin Donoghue said he was “extremely confident” that the buffer zone could withstand a court challenge. “The public health and safety is served” by the restriction on the protesters, he said. Demonstrations will be prohibited within 39 feet of Planned Parenthood’s entrances on Congress and Elm streets. The buffer zone is modeled after a state law in Massachusetts. Portland Neighborhood Prosecutor Trish McAllister said the U.S. Supreme Court is scheduled to hear oral arguments in January on the constitutionality of that law. If that law is struck down by the court, Portland’s law will become void, she has said. For about a year, 10 to 25 anti-abortion protesters, including children, have gathered regularly in front of Planned Parenthood’s entrance on Congress Street, some holding large signs showing graphic photos of aborted fetuses. Some shout Bible verses at women and call them murderers as they enter the building. Soon after the protests started, Planned Parenthood hired police officers to ensure that the protests did not get out of control. The clinic also has volunteers in brightly colored vests help patients navigate the crowd. Police have reported no arrests stemming from the protests. Planned Parenthood surveyed nearly 200 patients about the protesters. Nearly all supported the buffer zone, while nearly 70 percent (137 of 199) said they felt harassed and intimidated, the organization said in a news release Friday. An additional 51 patients indicated that the proximity of the protesters made them feel uncomfortable. Police Chief Michael Sauschuck said police have been monitoring the protests closely since March and have not seen any crimes. However, he said, “without question, there are individuals who feel harassed or threatened” when they enter the clinic. The council’s decision came after more than an hour of public testimony Monday night. About 45 people testified in support of the ordinance and six people opposed it. It was the first time anyone had spoken against the proposed buffer zone at a public hearing. Protesters had an unlikely ally in Doug Emerson, who has been a staunch free-speech advocate for artists in the city. Emerson said he doesn’t agree with the vitriol of the protesters, but supports their rights. Patients and the clinic’s staff contended that the protests go beyond free speech. They told the council that they feel harassed and intimidated when they enter the clinic. Becky Hunt, a physician, said the protests “threaten the lives and well-being of women,” who have canceled appointments because of the protests. 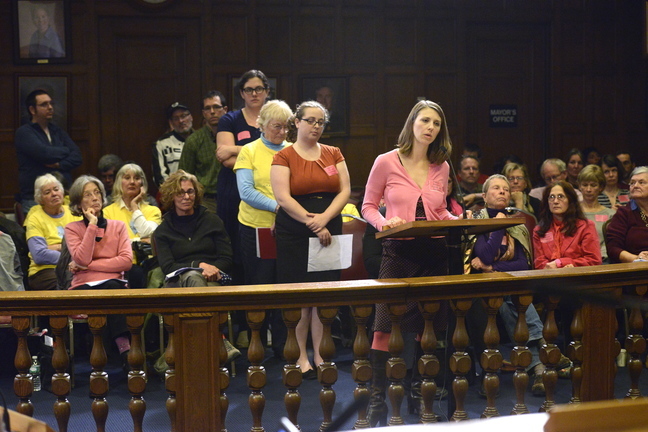 Julia Kahrl spoke in favor of the buffer zone. Wearing a bright-yellow Grandmothers for Reproductive Rights T-shirt, she noted that abortions are only a small percentage of the health services offered at Planned Parenthood. Other services include screening for sexually transmitted diseases, and for breast and cervical cancer. “We grandmothers are among those patients and we’ll need those services for the rest of our lives,” she said.